I recently did the clear corner mod for my newly acquired S4 and now that I’ve done this mod four different times (twice for myself, twice for friends), I felt it was long overdue to write-up my process and share some tips. It’s not a tricky mod per say, but it does require you to take the bumper off so it does take some time and patience to line up everything back up when you’re done. 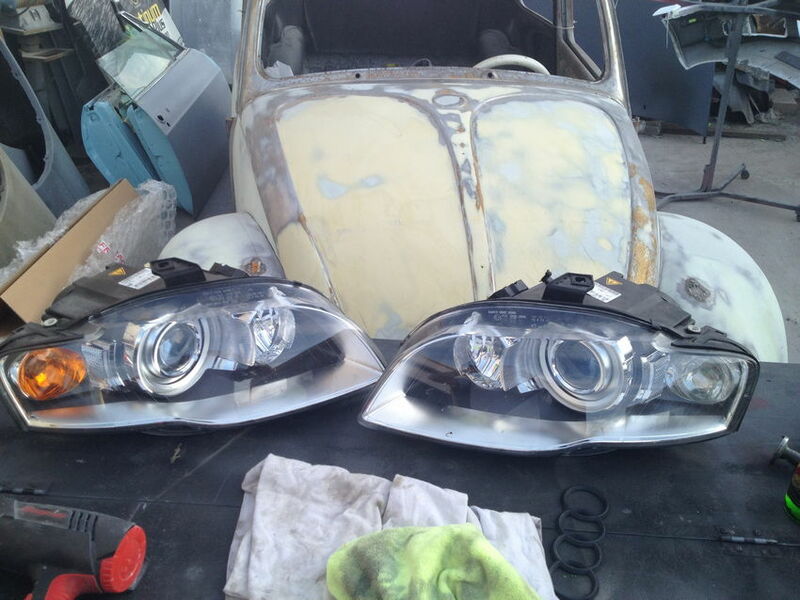 The basics are pretty easy – remove headlights, use a hair dryer or heat gun to loosen the glue, pull the headlight lens off, remove the amber reflector, replace with a clear reflector (optional), then put the headlights back on & reset the glue with the heat gun and reinstall everything. Likewise since you’ll have the bumper off and headlights out, it’s a good time to replace the grille or plasti-dip it, change out the headlight bulbs, DRLs, or City Lights, or even replace the side reflectors, since all of those items will be easily accessible. It’s only three bolts, and two are really easy to get to – all three are T30 Torx Bits, but the final one (the tricky one) can be removed using a flathead screwdriver. The middle one is the easiest and you’ll remove it completely, so start there. The screw closest to the grille only needs to be loosened but does not need to be removed completely, and is easy to access. Once you’ve loosened the third bolt, the headlight will then pull forward and come out. Remove the wiring harness so you can work on the headlight on a work bench or table. 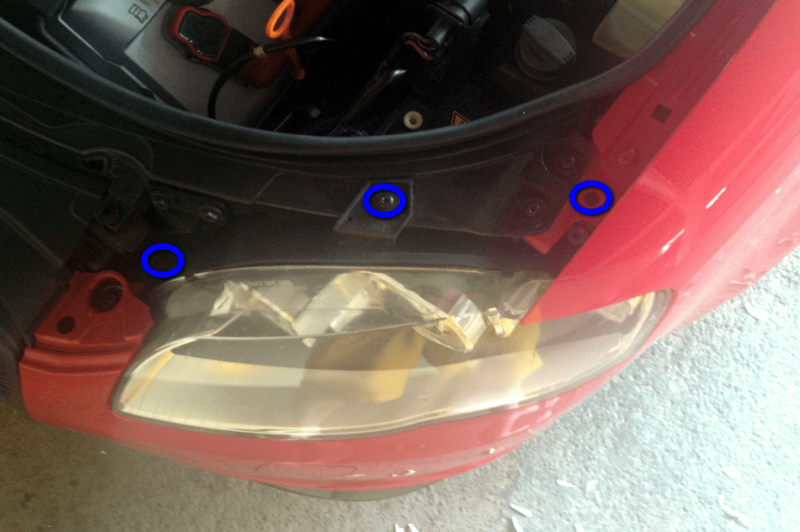 First you’ll remove five metal clips that hold the lens from the rest of the headlight housing. Two are located on top as shown above in blue. There are three on the back as well. These pop out really easily with a flat head screwdriver. Hold on to them as you’ll need to reinstall later. Next, use a hair dryer or heat gun to heat up the glue. Do not overheat to the point of melting anything, but give it some solid heat all around the seal. Once it seems nice and warm, start to pull apart from one end. You may need to pull for 20-30 seconds before the seal is broken but then they’ll pull apart very easily. The glue will stretch so try to keep the glue out of the housing…Audi provides copious amounts of glue so you won’t need to add any extra to reseal the housing, you’ll just need to reheat the seal and you should be set. Note: some people bake their headlights in an oven to do this. I don’t recommend that as you may melt the housing and your heating everything, rather than only the glue. Using a hair dryer or heat gun lets you concentrate the heat where you need it without risking overheating or melting other components that do not need heat. 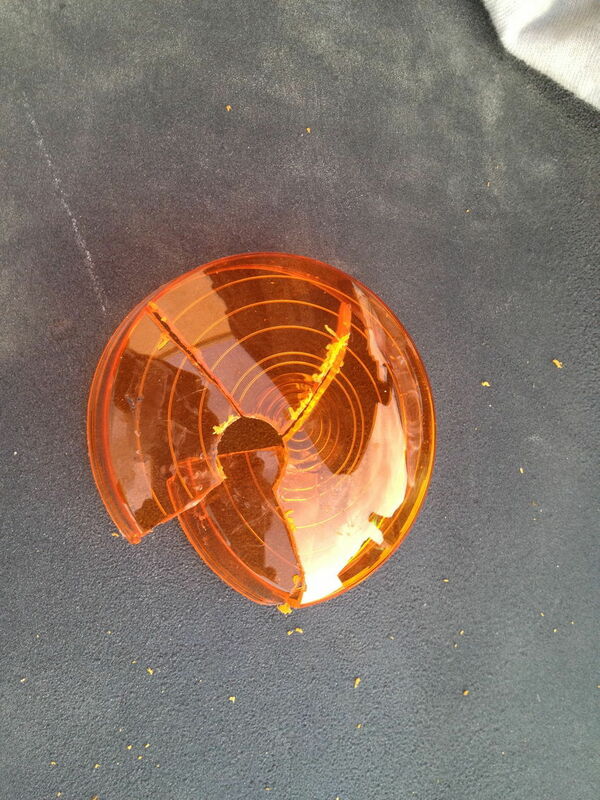 There are a few methods to remove the amber reflector – I’ve done all of them. The easiest (but most dangerous) method is to remove the amber cap with brute force by hitting it with a screwdriver to pop it out. You have to apply a LOT of force to do this – watch this video to see. I strongly recommend against this as you risk breaking the headlight housing. The hardest method is Phil’s method (fly300kts) and it’s definitely the most careful route but requires a lot of patience and time. Phil is a little more meticulous than you need to be, there really just 4 torx bits you need to remove and you can loosen the housing enough to slide out the amber reflectors. The middle ground is what I’ve done above, using a dremel to break the amber housing, and then it just falls out – this way you don’t risk hurting the housing, but the downside is you can’t reuse the ambers if you want to. 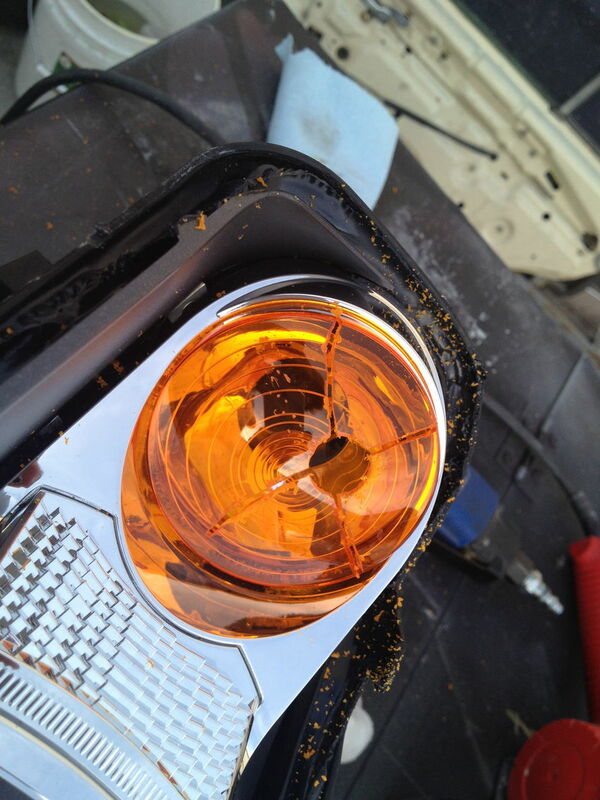 You’ll want to use compressed air or an air gun to blast out any shavings from the amber reflector out of the headlight housing, but otherwise it’s a very easy & relatively risk-free method. You can replace amber reflector with a clear reflector, which I think looks really nice and completes the OEM look. Likewise, I recommend replacing the turn signal bulb with a “chrome” bulb that still lights up orange but looks clear. If you reuse the OEM turn signal bulbs they don’t light up orange and instead look like a normal halogen bulb, which kind of looks off. First plug the wiring harness back into the headlight and test that everything works right (e.g. you screwed the bulbs in correctly). Next, install the headlights first and pay close attention to how they line up with the fender. If the headlights aren’t lined up correctly, you won’t get the bumper to line-up either. You may need to loosen the bolts and then re-adjust once you have the bumper back on. When installing the bumper first put the middle section on and make sure the bumper height adjusters on the crash bar haven’t moved and the bumper sits properly on them. Next press the bumper in and tighten the three screws on the top of the bumper first. Check for fitment and adjust as necessary, then tighten the two 10mm nuts inside of each fender. Check out this DIY if you have trouble getting the bumper, hood or headlights lined up with minimal gaps: http://www.audizine.com/forum/showthread.php/414080-Bumper-Hood-Gap-Adjustment-(after-bumper-removal). Lastly, finish up the remaining screws & bolts and you’re done! Hey nick, quick question, I want to install bi xenon oem audi headlights for my non- xenon a4 b7 2007, do you need a Vag-com cable? You’ll need a new harness/adapter for the lights – a company called Kufatec makes a halogen to bi-xenon wiring adapter that you can purchase (around $100 I think) and then yes, you’ll need access to a vag-com setting to reprogram your lighting from halogen to bi-xenon as well. Good luck with the conversion, it’s well worth it! sorry i know that those are a lot of questions, i am just not very good at this stuff and trying to learn! 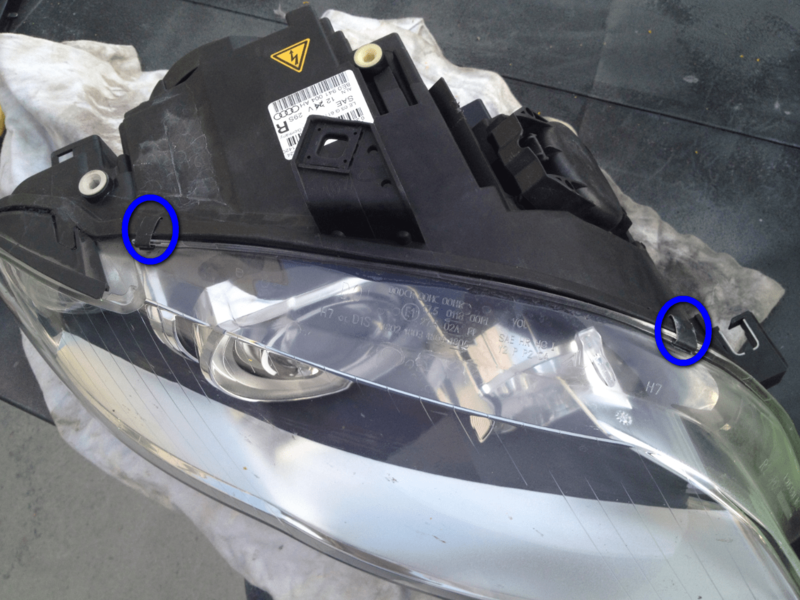 The clear corner process as well as the LED DRLs and turn signal are all the same. Ditto all other bulbs in the headlight housing minus the main headlight bulb itself. 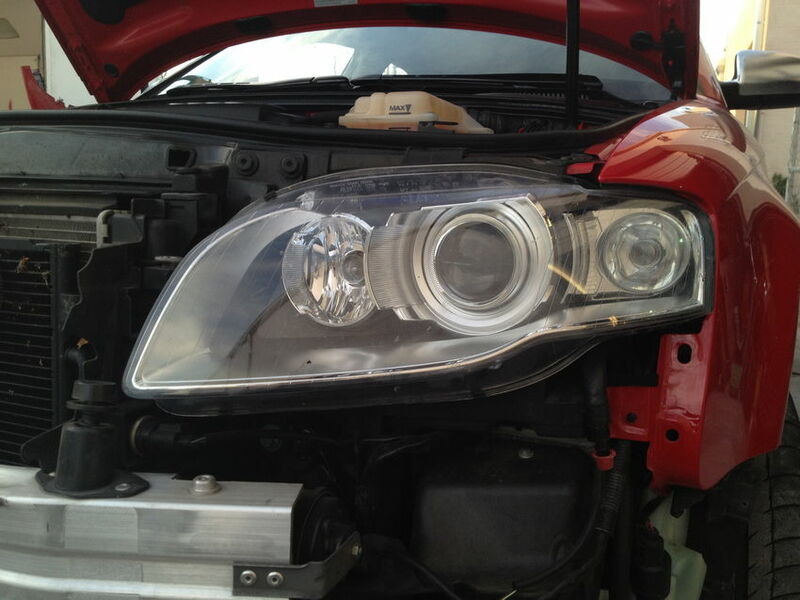 The only difference is if you want to change the main headlight bulb from a halogen bulb to a xenon bulb. The halogen bulbs are H7 sized bulbs whereas the OEM HID lights are a D1S bulb. If you want to upgrade the halogen headlights, you can either get a H7 xenon-look bulb which is essentially just a replacement bulb that has some xenon gas in it and looks more whitish-blue – there are a bunch on the market like these from Philips: http://www.amazon.com/gp/product/B00480J4PU/ref=as_li_ss_tl?ie=UTF8&tag=niscabl-20&linkCode=as2&camp=1789&creative=390957&creativeASIN=B00480J4PU. The other alternative is to get a full HID retrofit (like I did with my fogs) that comes with ballasts. You’ll want an H7 HID kit like this one: http://www.amazon.com/gp/product/B000O50ESO/ref=as_li_ss_tl?ie=UTF8&tag=niscabl-20&linkCode=as2&camp=1789&creative=390957&creativeASIN=B000O50ESO. The only downside to a full HID kit is that the light is very bright and the halogen headlight housings don’t have a projector, so they can’t direct the light as well and there won’t be a cutoff, so it might blind some drivers. Thank you so much! I feel like i should go with the first option instead of a full HID kit (for safety, as well as i think it is easier to install correct? just screw off the old one and put in the new? ), but just one more question, would they all match (the lights) if i go with the H7 xenon-look bulb, or at least be pretty close? The LEDs will all match, hard to say if the main headlight bulb will be a perfect match but it should be pretty close I’d think. Shoot for a main headlight bulb that is close to 6000k in light temperature/color. hey Nick, AWESOME site! do you have any ideas on how to make my side view mirrors light up as turn signal? appreciate any info, as well as your dedication to all of us AUDI lovers! 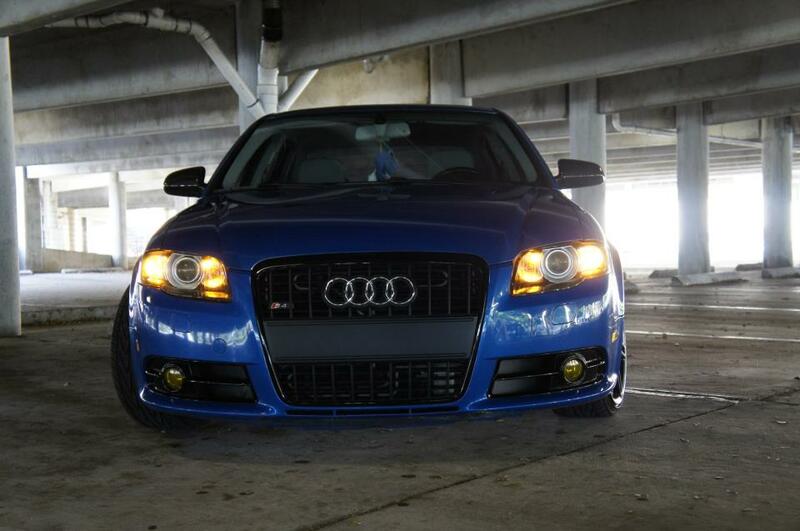 Nice write up – I have BI-Xenon A4 B7 headlights (damaged) and like to add aftermarket dark halogen headlights. Will the mod work with Kufatec harness. The link is now there (to Ebay) probably he didn’t have any listed when it wasn’t. Strange the only place I can find that can supply ‘Euro’ lenses is a guy in Florida 🙂 – I will order some it makes a better finished job. I was wondering how easy the process of re-sealing the headlights is and if you have ever had any problems with the lights not completely re-sealing and allowing condensation in? Thanks, been wanting to do this for a while but just haven’t had the guts to pull the trigger just yet. Hey Nick, I have a b7 a4, I am looking to get the clear corner mod. But I’m having trouble finding where to buy the clear lenses. Can you possibly give me the link to where I can order these lenses? The halogen lenses can swap over, as can the sedan headlight assemblies, but I’m not sure on the body panels. The tail lights are definitely different, I’m not sure what parts are available for that. I got a question, like Rob Nicholsen said. When I have removed this indicator amber lens cover. Where can I buy a clear lens cover? They dont sell anything here in Norway. A guy who goes by “fly300kts” on Audizine makes replica ones, you can email him at tbm850@gmail.com to buy a pair. They cost about $60USD, plus whatever shipping would be to Norway. I have a 2006 A4 and bought the exact Crescent T30 listed above from Amazon and just got back in from trying this and it is almost two inches too short to reach the screw at the bottom. Was my car made on a Monday or are there different versions? I just went back on Amazon to buy an eight inch T30 to try again. Hey Will – it’s been a long time since I wrote this so I can’t remember if I used a 6″ or maybe it was an 8″ – I think I actually just used a long flathead screwdriver which worked just fine TBH. I updated the post to recommend an 8″ screwdriver, sorry the 6″ didn’t work. It looks like the link for the chrome turn signal bulbs is dead. Could you point me in the direction of some correct ones on Amazon? Those links worked great. Thanks! What do you think I should get for those? The same effect can’t be achieved with a standard bulb? Cool. Thanks for the help and props for having such a clean, easily navigable site with good photography and writing. Sadly that’s a rarity in the car community. Where can I get the clear Amber reflector ? Hi Sam – it’s in the post, but email Phil at tbm850 at gmail.com and he’ll take care of you! Question Nick – Where can I buy a metal clip for the front light lens? I lost one to the metal part that’s underneath the 2006 a4 and need it replaced. Any suggestions what to look up or where to get it in Wisconsin? Oh boy. I would check out ECS tuning or call the nearest dealer. Hopefully Audi sells those seperately and doesn’t require you to buy the whole housing – but if they do, it’s probably okay to be missing one as long as the rest are in there. I love your blog post. I already contacted Phil regarding the clear reflector turn signals lenses. I have halogen headlights for my audi a4 b7 and was wondering if you knew any good LED brands that would fit. For both low and high beams. Thanks. Bummer – you want a 1156 bulb…in theory you could reuse the stock ones, but they’ll light up yellow rather than orange. The best ones are coated silver but orange underneath, so that way they light up orange but don’t make the housing look orange. I updated the post with some alternatives that should work. Thanks Nick! I appreciate your time and quick response. Ordering today and will replace my headlight lenses at the same time I do the clear corner mod. Saying goodbye to pitting and yellowing. 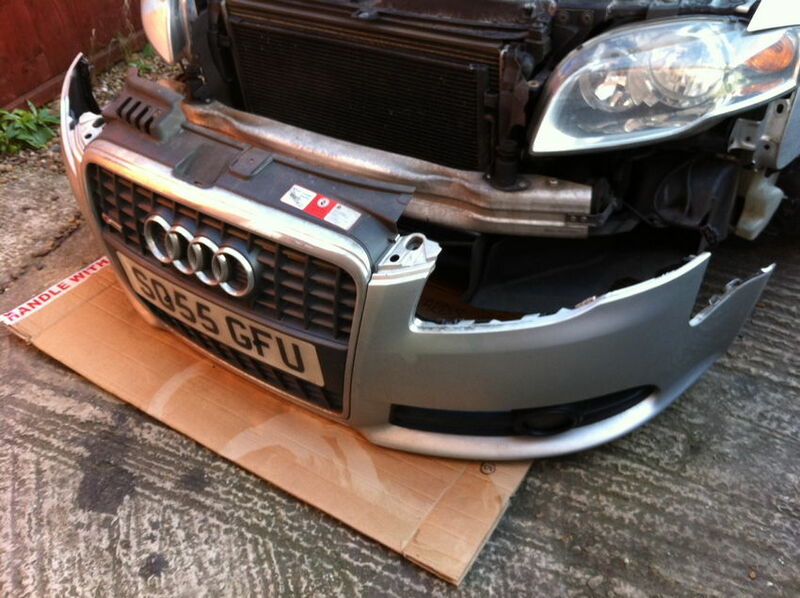 Hey Nick, Trying to get around to doing the clear corner mod on my RS4.. The audizine link doesn’t seem to work anymore. Is there somewhere else i could purchase the clears? Figured I’d do this while I’ve got the bumper off. lol. Yeah – email Phil at tbm850@gmail.com and he can get you sorted. Did mine when I had to replace my bumper a couple of months back. Went out the other night and noticed my new clear lenses had melted! Has this happened to anyone else? 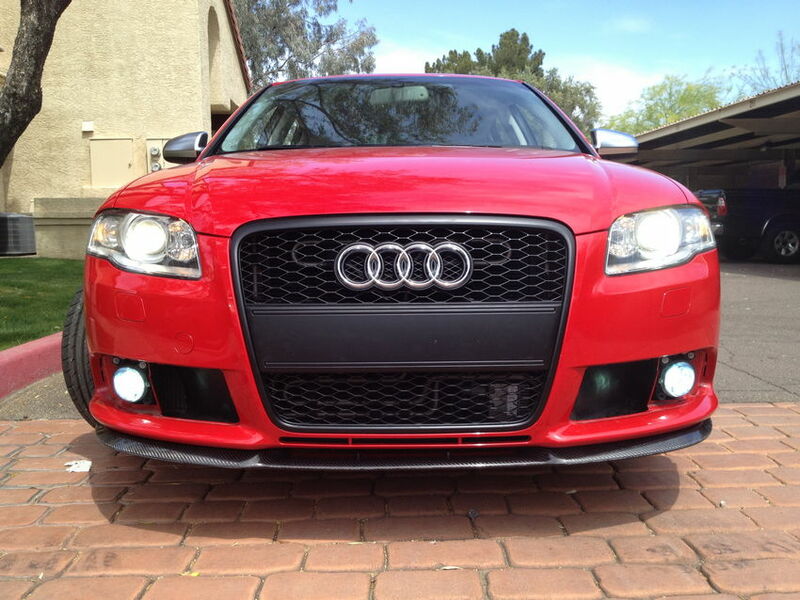 BTW if you are going to be at Big SoCal Euro I’ll show you how my Hofele RS bumper came out on my B7 Avant S4…. I haven’t heard of these melting! Did you have LEDs? No, the chrome coated ones you had up on the DIY…. Damn, that’s super disappointing…I can’t see why that should happen, the bulb is the same wattage so the only difference is the silver coating on it. I used to link to a different version but it’s no longer on Amazon. Nick, by any chance is there a video or link that I can look at on how to do this mod step by step on my b7? I’ve looked some up but they just show before and after pics or videos but never really anything on how to do it step by step. HID vs LED for Cars – Which is Better?